Miley Cyrus forced to postpone more shows after her medical allergies return. After having to reschedule a handful of her Bangerz tour dates in the U.S. earlier this month, Miley Cyrus has now been forced to postpone her upcoming concerts in Amsterdam and Belgium as she has "had a health setback and her allergic reaction issues have returned." Yesterday Miley tweeted, "spoke to [sic] soon ... R u f*cking kidding me?!?!?!?? #aprilcangof*ckitself," adding another tweet with about a hundred crying kitty face emojis. And this was just one day after Miley chatted with Ryan Seacrest about how thrilled she was to get back on tour! “I’m doing good, much better, happy to be on the phone with you guys,” Miley told Ryan and co-host Ellen K on Monday. “So basically I had gotten sick while I was on the road. On the sixth day [after taking prescription antibiotics], I just woke up … it was so scary … I had basically been poisoning myself with something I didn’t know I was really scary allergic to.” Miley spent a night in the hospital, and just when she thought she was out of the woods she fell ill again the next morning and was forced to go back to the hospital for another week. Miley was placed on medical rest by her doctors last month, and at the time her rep said in a statement, "Miley was suffering from a sinus infection during her tour. She was prescribed the antibiotic Cephalexin which she's now suffered an extreme allergic reaction to. This type of extreme reaction can last from five to 27 days in these types of cases. She will remain hospitalized and is under a doctor's care until we see some improvement in her condition and is asking for your compassion and privacy at this time. 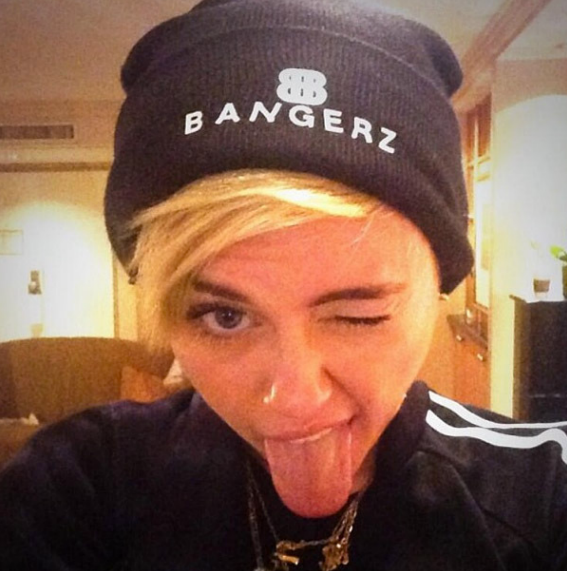 Miley is devastated about missing shows and possibly disappointing her fans." It's not clear of more dates will be moved around while the 21-year-old pop superstar recovers -- hopefully she gets better soon! I see she finally got that thrash off her tongue. she is resisting her beta kitten monarch programming.